Hands down, one of the hottest topics doing the rounds in the technology world and marketing forums is Voice Search and its significant impact on SEO. Ever since Apple launched Siri, Voice Search has rapidly grown to become a handy feature across smartphones. Scratch that, you now have Amazon’s Alexa and Google home that has redefined the way we search the web. It’s safe to suggest that for most people, voice search has become the primary search method. In fact, in a survey of SEO trends for 2017 and beyond, voice search stood at the third spot. This is because it’s easier to talk than to type. Also, you can search for anything conveniently on the go when you are driving or commuting or running. With the sudden surge in the use of voice assistants, optimizing for voice search is critical to your SEO success. In this article, we will show you how to optimize your website content for the era of voice search and make the most of it. Before we dive into Voice Search, first let’s dial back to understand how Google’s Humming update paved the way for voice search to become a reality. Back in 2013, Google launched the Hummingbird – a major algorithmic update that started considering the user intent and contextual meaning of queries. This drastically changed the way brands and businesses went about optimizing for SEO. Marketers went from stuffing keywords in articles to addressing the pain points of their target audience. 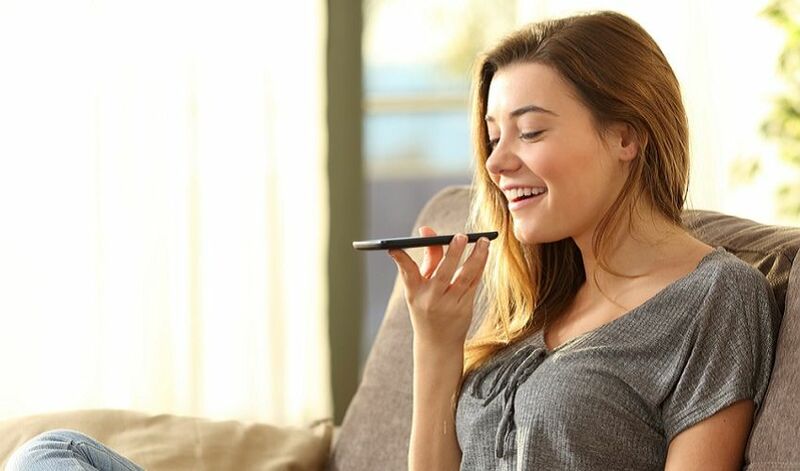 With Voice assistants, the search experience has transformed to become more intuitive and it provides a better search experience since people can talk their queries out instead of typing it. Voice technology relies on Natural Language Processing (NLP) to recognize voice texture, interests, and behavior. As Google and other search engines continue improving their algorithm, we can expect the user experience to become more seamless and smoother. From self-driving cars to voice assistants to chatbots, Artificial Intelligence (AI) is everywhere. It’s a technological marvel that is here to stay. In fact, AI is a phrase synonymous with the advancement of technology that is slated to transform our lives. Most tech startups are themed around developing AI solutions. Typically, voice searches are long form and conversational in nature. This means they are longer than a search query that you would type on Google. For instance, you would type ‘buy shoes online’ as opposed to ‘show me the best deals on formal shoes right now’ as a voice search. You may be wondering that voice search optimization is all about using the right long tail keywords. However, that is not true. Voice search contains question phrases that you can search for using a tool like Answer the Public. You can also check out tools like Question Samurai and StoryBase for picking natural language phrases. Google recently disclosed that “near me” searches have grown more than 130% YoY. This is attributed to people extensively using their smartphones and searching for things on the fly with the search query for “things to do near me.” Not many know that 50% of local mobile searches by a consumer lead to a store visit in a day? Since most people use voice search on their smartphones to search for local queries, it is essential to get the keywords right. People who use voice search have a clear intent when looking for services by a local business. So, don’t expect users to visit your website. For instance, if a user wants a haircut, he/she will perform a voice search for nearby salons. Google will immediately return with information on the nearest salons, their addresses, distance from the user’s location, timings, and reviews. Based on the reviews and ratings, the user will select a salon and directly click on the “Call” button to book an appointment. He /she will not visit your website. To make the most of voice search, your business should have several positive reviews and high ratings. Also, it is wise to update your office hours, contact details, and physical address. As we mentioned earlier, voice search is used to search for local businesses. To help your customers find you without any difficulty, it is imperative to claim your Google My Business listing. Start by mentioning your business information on your website’s footer in a simple text format. Users are accustomed to seeing this information on the footer. “Chinese Restaurants in Delhi” — For search queries such as this, if you have optimized your site for local keywords, then your website will rank higher in search results. “Chinese Restaurants near me” — For search queries such as these, Google relies on the user’s location in respect to the location mentioned in your Google My Business listings to match the closest results. For your Google listing to work efficiently, it is essential to clearly and accurately mention your business’s name, address, and phone number. Another important criterion is to choose the right business category. Selecting the wrong category can make the difference between your business appearing at the top vs. disappearing from the voice search results. Additionally, you should upload high-quality images of your office and team and your business in general, to persuade users to visit your website. Stay consistent when filling out your NAP information on other business directories. Even minor differences in your basic information such as name or address can be detrimental to your local SEO. Since voice searches only happen on smartphones and smart tablets, it is necessary to have a responsive website design that works seamlessly across all screen sizes and is device agnostic. There are numerous responsive website themes available on WordPress and even Google recommends using a responsive website design. To check if your website is responsive and compliant to Google’s requirements, you can use Google’s Mobile-Friendly Test Tool. If all is well, you will get a candid pop up confirmation message that says, “Page is mobile-friendly.” And if there are things needed to be fixed, Google will indicate the specific steps you need to take. Don’t forget to design your website whilst leaving enough whitespace. When it comes to content curation and articulation, use short sentences and smart typography along with simple words and small paragraphs and engaging sub-headings. As a tech professional, you are no stranger to the message, “Sorry! That domain is already taken.” Does that mean you have to settle for a less desirable domain name for that project or startup idea? It wouldn’t be fair if you had to because a great domain name is critical to a website’s perception, and success thereof. Which is why you need to keep an ear out to listen to what words people use when searching for your business and talking about you. When you have the necessary information about the common questions and phrases used to search for your business, you can create content accordingly to address them. Big brands and companies often limit their efforts to creating an FAQ page. It is recommended to create dedicated blog posts based on your customers’ questions. Feel free to optimize and edit the existing content on your blog and product pages to incorporate content to address voice search queries. All in all, creating relevant content to address users’ questions significantly increases your chances of appearing higher in voice search results. Optimize your website for the era of voice search and watch your business grow!